LaMa's entry for FAF made me think of one of my favorite illustrators, E. H. Shepard, and his illustraions for the classic (children's?) 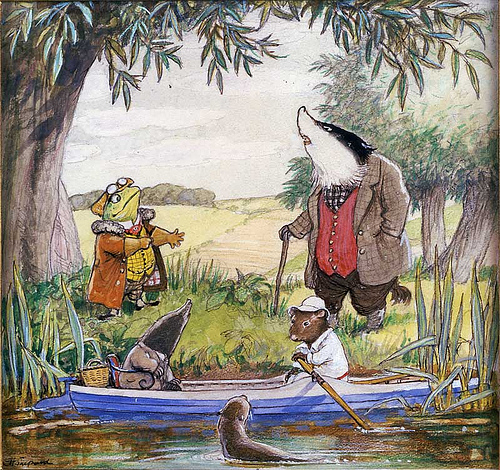 book, The Wind in the Willows. I put a question mark by children's, because I think it is profitably read by EVERYONE, and if you haven't read it lately, you should get it, make yourself a little snack, and sit down and READ. Shepard captured the essence of Grahame's "little people" very well, don't you think? 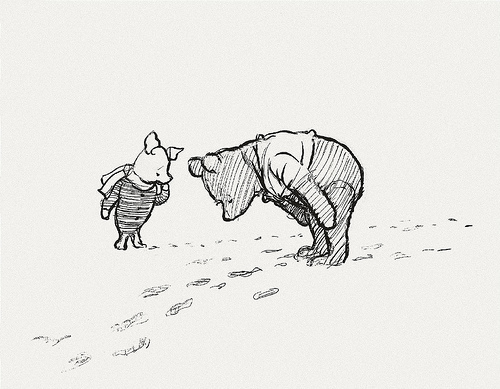 Story has it that Shepard came to resent Pooh, because he felt that it overshadowed his other work. But Milne liked his illustrations so much that he cut Shepard into the royalties, no small thing for an illustrator. The man is genius. Sheer genius. Happy Friday, ya'll. Go out and read some good children's literature, even if you don't have a kid to read it to! This page contains a single entry by MamaT published on May 7, 2010 9:18 AM. Friday afternoon lagniappe is the next entry in this blog.